It was a Super Tuesday indeed for Two Rivers (Alaska) musher, Aliy Zirkle who won the PenAir Spirit of Alaska Award for running first into the McGrath checkpoint in this year’s Iditarod. Zirkle is in first place 329 miles into the race in a 66 musher field that is vying for position to make it to Nome to claim a $50,000 purse and a new Dodge truck. 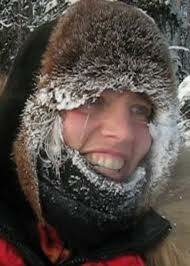 A former Yukon Quest winner, the Iditrarod has eluded Zirkle and all women since the great Susan Butcher won in 1990. The Pen Air Spirit of Alaska Award is given to the first musher that arrives in McGrath. The award is a beautiful original “spirit mask” especially created for this event by Bristol Bay artist Orville Lind. In addition, Zirkle received a $500 credit toward travel or freight shipment. The PENAIR SPIRIT OF ALASKA AWARD will be presented to Zirkle again on March 18th in Nome, Alaska at the Mushers Award Banquet. Zirkle didn’t waste anytime after arriving in McGrath, only spending four minutes at the checkpoint before heading onto Takonta where she will (presumably) take her mandatory 24 hour rest.